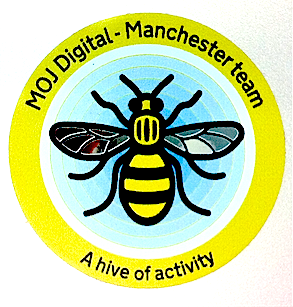 The Manchester branch for MOJ Digital Services was set up in April 2014 with a goal of reducing the number of unnecessary visits to court when defendants simply wanted to plead guilty. Working out of Manchester’s magistrates’ court, we’re developing a product that fulfils a defined user need and can be deployed nationwide. I joined as content designer in November 2014 and quickly understood that this team is capable, self-confident and clear about its approach to product development. Initial discovery was to understand the process, the users’ needs and ‘pain points’. We spoke to defendants who had turned up to court, ushers, legal advisers and magistrates. And by observing court hearings and looking at the type of paperwork being sent out to defendants it was possible to build a picture of why people were turning up to court. The discovery phase found that people were confused by all the paperwork they’d been sent and were having to turn up in court just so someone could tell them what to do. 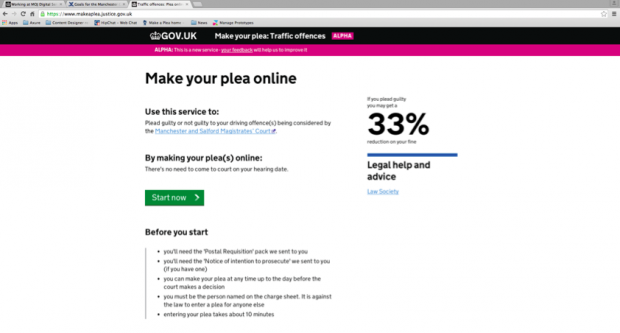 So, through research and user feedback, a new form was developed explaining that defendants could make a plea online, see their plea sent to the court (and receive email confirmation) and then just wait for the court to inform them of the result and what to do next. The development process has had a clear focus on producing the minimum viable product through iterative development. And the team has grown organically to involve specialists as required. We’ve worked closely with Greater Manchester Police and the Manchester and Salford Magistrates’ Court, building effective working relationships so that everyone in the process understands the benefits of engaging with the product’s development and clear about the goals. Being located in the magistrates’ courts in Manchester has really helped this positive partnership working. The Make a Plea service has the capacity to develop quickly, but for many of the ‘nice to haves’ we’re dependent on external organisations, which have their own requirements, working practices and their own way of doing things. 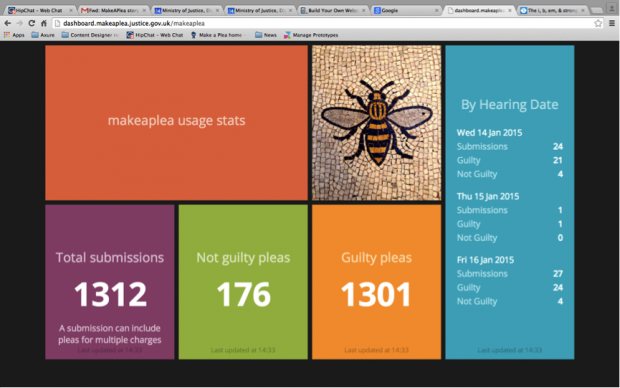 Just before Christmas 2014 we hit the 1,000 pleas and the dashboard (below) sets out some of the latest statistics. The immediate future for Make a Plea involves its service assessment at the end of January. Looking further in to the future we’re working to demonstrate the ‘national scalability’ for the service as it is currently designed to work in Manchester and Salford. This involves research to find the next area with the capacity to use Make a Plea. We then develop iteratively as we discover the different requirements of a service used by multiple prosecuting authorities and their associated courts. Also firmly on the radar is all the discovery we’re doing to align the Make a Plea service with the requirements of the Single Justice Procedure. It’s interesting times up north! Sorry you've had problems getting access. I've forwarded your query on to someone in the team to get back to you.